I am an experienced instructor with formal training in training and development. I am also an excellent public speaker and love being before people sharing the knowledge I've accumulated over the past decade. 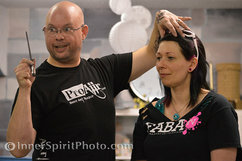 I am dedicated to providing the best artistic workshop I can. I have put a lot of time, experience and know-how towards my teaching technique. So here's what to expect. judge-free zone and bring a sense of togetherness with each other. I use my humor to keep the atmosphere light, friendly, warm and fun...then I drill as much knowledge I can into your brain. People learn more when they're having fun. I have always had a knack at explaining things to people. 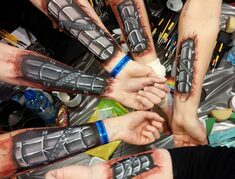 As you can see from a small sample of my student's self painted robotic metal arms, the results speak for themselves. Most people who attended these classes did not think that they could paint like this and were surprised at how easy it was when the day was done. At the end of the sessions everyone has at least one great picture for their portfolios and dozens of other photos to remember the experience. I share info, step by steps, handouts and do my best to keep in contact with previous students in an attempt to keep the tribe unified and together. I am always trying to guide the pack to positivity, growth and professionalism. People are upping their game, which is only helping the industry more. We paint better designs, with superior products in shorter amounts of time than ever before. I am in awe at how big the world of face and body painting has become in my time as a painter. It's because the joy and love it brings to people expands the herd, and that's exponential. It'll take a hundred years, but I'm sure that'll take over the world. Because Face Painting is AWESOME!